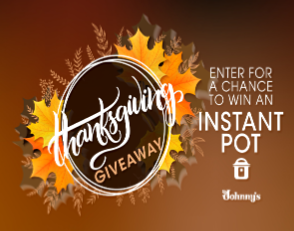 Johnny’s Fine Foods Thanksgiving Giveaway – Win an Instant Pot! ENTER SWEEPSTAKES HERE – Johnny’s Sweepstakes page. ENTRY LIMIT – You may only enter once per email address. ELIGIBILITY – You must be over 18 years of age to enter and live in the United States. SWEEPSTAKES ENTRY PERIOD – This contest runs from November 8 to November 21, 2018, at 12pm MST. You must be over 18 years of age to enter and live in the United States. PRIZES – The Instant Pot being given away is a 6 Qt 6-in-1 Multi-Use Programmable Pressure Cooker. The Instant Pot description is the following: Built with the latest 3rd generation microprocessor technology, up to 240 minutes pressure-cooking up to 24 hours delay start, automatic Keep Warm up to 10 hours, 3 temperatures in Saute & Slow Cook. Healthy, stainless steel (18/8) inner cooking pot made from food grade 304, no chemical coating, 3-ply bottom for even heat distribution, fully sealed environment traps the flavors, nutrients, and aromas within the food. Power supply: 120V – 60Hz. 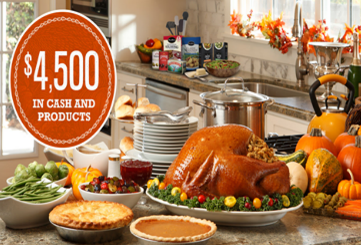 Mrs. Cubbison’s Friendsgiving Hero $3,600 Sweepstakes – Win $500 in gift cards! Win gift cards worth $500! ENTER SWEEPSTAKES HERE – Mrs. Cubbison’s Sweepstakes page. ENTRY LIMIT – Limit of one (1) entry per person per 24 hour period during the Promotion Period. ELIGIBILITY – The Mrs. Cubbison’s Friendsgiving Hero $3,600 Sweepstakes is open only to legal residents of the fifty (50) United States (including District of Columbia) who are at least eighteen (18) years old at the time of entry. SWEEPSTAKES ENTRY PERIOD – The Promotion begins on November 1, 2018 at 12:00 P.M. Pacific Time (“PT”) and ends on November 30, 2018 at 11:59 A.M. PT. WINNER’S LIST – To obtain a copy of the winners list, send a self-addressed stamped envelope to Mrs. Cubbison’s Friendsgiving Hero $3,600 Sweepstakes c/o matrixx Pictures LLC, 3122 Santa Monica Blvd., Ste. 201, Santa Monica, CA 90404. Winner’s list requests will be accepted no later than December 31, 2018. VT residents may omit return postage. 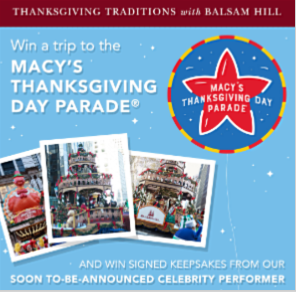 Thanksgiving Tradition with Balsam Hill: Win a Trip to the Macy’s Thanksgiving Day Parade! Win a trip to the Macy’s Thanksgiving Day Parade! ENTER SWEEPSTAKES HERE – Balsam Hill Facebook page. ENTRY LIMIT – Limit one registration per person and up to 107 entries total by completing tasks. ELIGIBILITY – This Sweepstakes is open only to those who are legal residents of, and located within, the fifty (50) United States at the time of entry. Participants must be at least eighteen (18) years old at the time of entry. 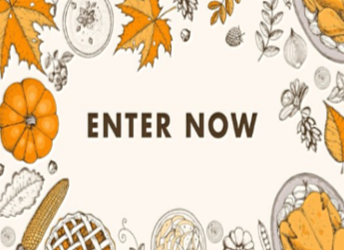 SWEEPSTAKES ENTRY PERIOD – Thanksgiving Tradition with Balsam Hill: Win a Trip to the Macy’s Thanksgiving Day Parade® (“Sweepstakes”) entry submission begins at 7:00 a.m. PST on October 25, 2018 and ends 11:59 PM. PST on November 8, 2018.
a. One trip for four (4) to New York, NY. The trip package includes: (i) round trip, coach class air transportation for four (4) people from a major airport (limited to the 48 contiguous states) near the winner’s home (determined by the Sponsor in its sole discretion) to New York, NY unless the nearest major airport to winner’s residence is within two hundred (200) miles of New York City, for which ground transportation for four (4) people will be provided; (ii) two (2) nights’ shared accommodation for four (4) people at a hotel determined by the Sponsor in its sole discretion; and (iii) four (4) tickets to the Macy’s Thanksgiving Day Parade® grandstand on November 22, 2018. ARV is USD $2000 (hotel accommodation for 2 nights and estimated costs of air or ground transportation). The grandstand tickets granted here under are not offered for sale and have no estimated commercial value. a. Signed CD from float performer (Promotional Partner). ARV is $10.00. b. Signed cookbook from float performer (Promotional Partner). ARV is $30.00. The winner must travel within the dates determined by the Sponsor in its sole discretion or the prize will be forfeited. Travel must be round trip. The specifics of the prize shall be determined solely by the Sponsor. If the winner chooses to redeem this prize for less than four people, the difference in value will not be rewarded. Travel will only be valid in 2018. 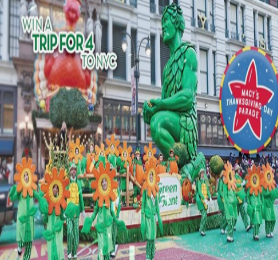 Green Giant® New York City Thanksgiving Sweepstakes – Win a trip to attend the Macy’s Thanksgiving Day parade! 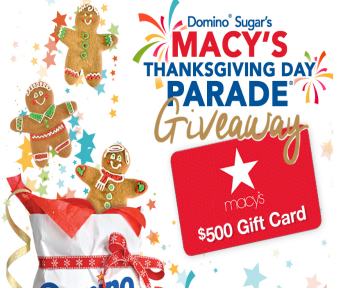 Win a trip for 4 to NYC to attend the Macy’s Thanksgiving Day parade! ENTER SWEEPSTAKES HERE – Green Giant Sweepstakes page. ENTRY LIMIT – LIMIT one (1) entry per person, per email address during the Sweepstakes Period. ELIGIBILITY – The Sweepstakes is open to legal residents of the fifty (50) United States and the District of Columbia, who are at least eighteen (18) years of age and the legal age of majority in their state of residence as of the sweepstakes start date. SWEEPSTAKES ENTRY PERIOD – The Green Giant® New York City Thanksgiving Sweepstakes begins at 12:00 p.m., Eastern Time (“ET”) September 1, 2018 and ends at 11:59 p.m. ET on October 14, 2018. PRIZES – One (1) Grand Prize winner will receive a trip to New York City for up to four (4) people to attend the Macy’s Thanksgiving Day Parade® (the “Parade”) which is taking place on November 22, 2018. This prize package includes hotel accommodations (one room, double occupancy) for two (2) nights in a New York City hotel chosen by the Sponsor along with up to four (4) round-trip tickets from the major gateway airport nearest the Grand Prize winner’s residence to a New York City airport. Also included are up to four (4) tickets to attend the Parade. The Approximate Retail Value (“ARV”) of the Grand Prize is $4,500 (approximately $900 for hotel & $3,600 for air or ground transportation). WINNER’S LIST – To request confirmation of the name of the Grand Prize winner, please send a self-addressed, stamped business-size envelope by November 15, 2018, to: Green Giant New York City Sweepstakes Winner’s List Request, 300 State Street, Suite 402, Rochester, NY 14614. Vermont residents may omit return postage. Mrs. Cubbison’s Perfect Holiday Sweepstakes – Win $500 in gift cards & more! Win $500 in gift cards & more! ELIGIBILITY – The Mrs. Cubbison’s Perfect Holiday Sweepstakes is open only to legal residents of the fifty (50) United States (including District of Columbia) who are at least eighteen (18) years old at the time of entry. SWEEPSTAKES ENTRY PERIOD – The Promotion begins on November 1, 2017 at 12:00 P.M. Pacific Time (“PT”) and ends on November 30, 2017 at 11:59 A.M. PT. 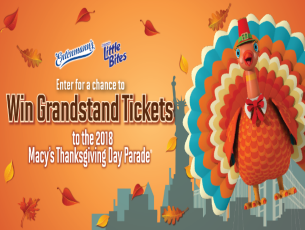 Entenmann’s® Macy’s Thanksgiving Day Parade® Sweepstakes – Win a trip to the 2018 Macy’s Thanksgiving Day parade & more! Win a trip to the 2018 Macy’s Thanksgiving Day Parade & more! ELIGIBILITY – Sweepstakes is open to legal residents of the fifty (50) United States and the District of Columbia, 21 years of age or older as of date of entry eligibility. SWEEPSTAKES ENTRY PERIOD – The Entenmann’s® Macy’s Thanksgiving Day Parade® Sweepstakes starts on August 24, 2017 at 12:00 a.m. Eastern Time (“ET”) and ends on November 30, 2017 at 11:59 p.m. ET. PRIZES – GRAND PRIZE (2): A trip for winner and up to three (3) guests to attend the 2018 Macy’s Thanksgiving Day Parade® in New York, NY. Trip consists of roundtrip, coach class air transportation from a major U.S. gateway airport nearest winner’s residence to New York, NY (exact airport to be determined by Sponsor, in its sole discretion), up to four (4) tickets to the 2018 Macy’s Thanksgiving Day Parade® Grandstand (“Grandstand”), and $1,000 for winner only in the form of a check which may be used towards hotel accommodations, ground transportation, meals and incidentals while on trip. The Grandstand tickets granted hereunder are not offered for sale and have no estimated commercial value. Approximate Retail Value of each Grand Prize: $4,000. Exact dates of travel to be determined by Sponsor, in their sole discretion. If winner resides within a 100-mile radius of destination, ground transportation will be provided in lieu thereof. Actual value may vary based on point of departure. Any difference between stated value and actual value will not be awarded. Win a $500 Macy’s gift card! ENTER SWEEPSTAKES HERE – Domino Sugar Sweepstakes page. ENTRY LIMIT – Limit one entry per person. ELIGIBILITY – To enter the Sweepstakes you must be (i) a legal resident of one of the states in the United States and be (ii) at least eighteen (18) years old at the time of entry. SWEEPSTAKES ENTRY PERIOD – The Sweepstakes begins at 12:00:01 a.m. Eastern Time (“ET”) on November 17, 2016 and ends at 11:59:59 p.m. ET on November 24, 2016. PRIZES – One (1) Grand Prize is available to be awarded in this Sweepstakes. The Grand Prize Winner will be awarded one (1) $500.00 Macy’s gift card (ARV – $500.00), one (1) Domino® Sugar Bear (ARV – $15.00), and one (1) coupon for use toward a Domino® Sugar Flip Top Canister product (ARV – $1.50). Approximate Retail Value of the Grand Prize is $516.50. 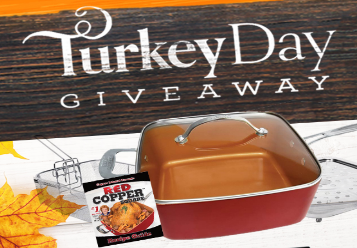 Bulkhead Turkey Day Giveaway – Win a Red Copper Square Pan 5-Piece Set & more! Win a Red Copper Square Pan 5-Piece Set & more (3 winners)! ENTER SWEEPSTAKES HERE – Bulbhead Facebook page. ELIGIBILITY – Open to legal residents of USA and Puerto Rico who are 18 or older. SWEEPSTAKES ENTRY PERIOD – The ‘Turkey Day Giveaway‘ begins on 11/01/2016 at 12:00 AM (Eastern Time (US & Puerto Rico)) and ends on 11/16/2016 at 11:59 PM. Mrs. Cubbison’s $4,500 Holiday Sweepstakes – Win $500 in gift cards & more! Win $500 in gift cards & cooking tools! ELIGIBILITY – The $4,500 Holiday Sweepstakes – Presented by Mrs. Cubbison’s is open only to legal residents of the fifty (50) United States (including District of Columbia) who are at least eighteen (18) years old at the time of entry. SWEEPSTAKES ENTRY PERIOD – The Promotion begins on October 3, 2016 at 12:00 P.M. Pacific Time (“PT”) and ends on January 6, 2017 at 11:59 A.M. PT. 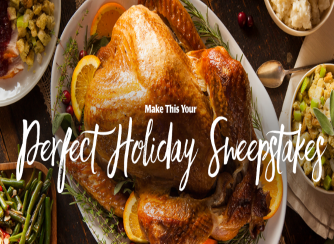 Food Network Ultimate Thanksgiving Essentials Sweepstakes – Win $3,000 & more! Win $3,000 & a Thanksgiving Essentials Toolkit! ENTER SWEEPSTAKES HERE – Food Network Sweepstakes page. ENTRY LIMIT – Limit of one (1) entry per eligible person, per day, during the Promotion Period. ELIGIBILITY – This Promotion is open only to legal residents of the 50 United States and D.C. who are 21 years of age or older as of the Promotion start date. SWEEPSTAKES ENTRY PERIOD – Beginning at 9:30 a.m. Eastern Time (“ET”) on October 15, 2015 until 5:00 p.m. ET on December 1, 2015. PRIZES – The Grand Prize Winner shall win the following (the “Grand Prize”): (i) $3,000 cash (presented in the form of a check), and (ii) a Thanksgiving Essentials Toolkit from the Food Network Store. Approximate retail value (“ARV”) of the Grand Prize: $3,500.